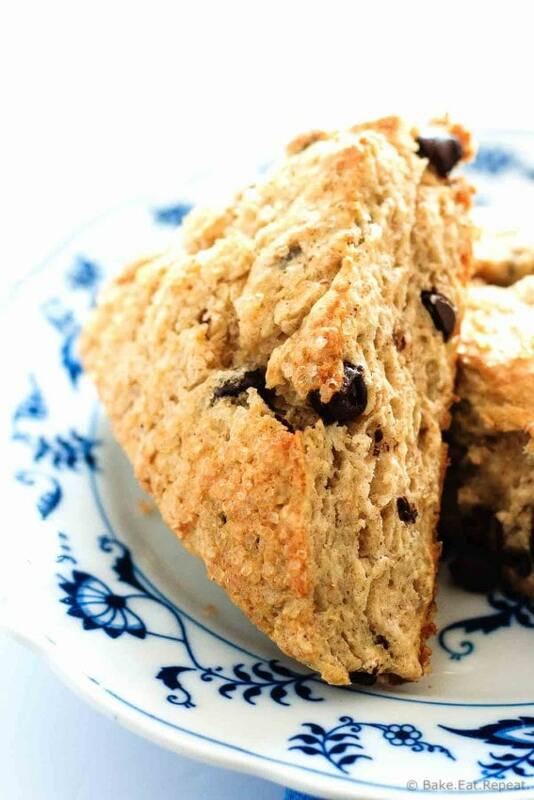 Flaky, tender, filled with chocolate chips and topped with coarse sugar – these chocolate chip scones make the perfect treat with your morning coffee! I think scones are my all time favourite treat to have with my morning coffee. Good scones at least. It’s always so disappointing when I decide to buy a scone somewhere thinking that I’m getting a wonderful, flaky, amazing pastry to enjoy with my coffee, and I end up with a dry, stick in your throat and end up throwing out half of it pastry instead. SO disappointing. Because they’re my favourite. These chocolate chip scones are good scones. Not dry, stick in your throat ones. I don’t make those kind of scones. I just buy them and wish I hadn’t. Why is it that whenever you’re in a coffee shop the baked goods always look so amazing? You know they won’t be. Or at least not as amazing as homemade would be. You know you’ll be disappointed. You know they cost WAY too much. And you still buy them. Just me? Please tell me I’m not the only one roped into buying ridiculously expensive and not very good pastries to go with my ridiculously expensive latte. I’ll feel better about it if I’m not the only one. I don’t get convinced nearly as often as I used to though. Mostly because I know that I can make a better one at home. And they don’t take long to make either. These are hot from the oven in under 45 minutes, and that’s with a 15 minute chill time. Plus, they use some whole wheat flour in them, which totally makes them healthy right? Negates all the butter and chocolate? I think so. Okay, they’re not healthy, but I’m sure they’re better then the local Starbucks. And if not better for you, at least they’re worth the calories. 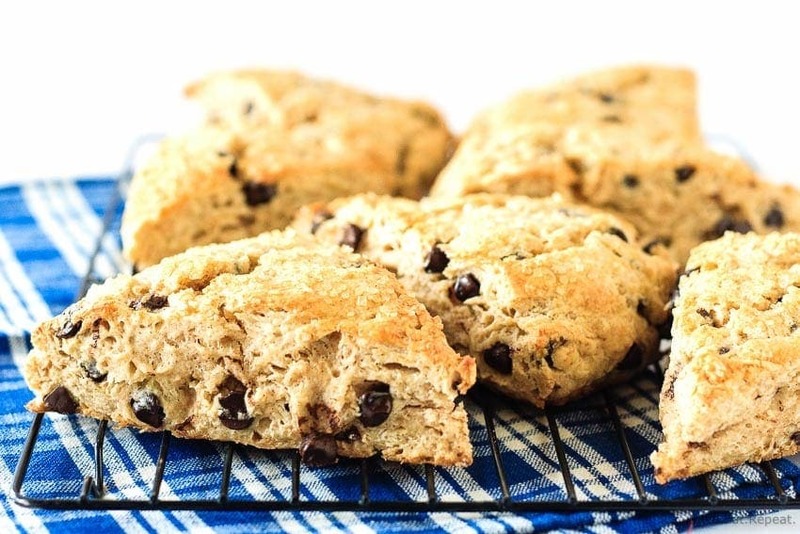 Flaky, buttery, chocolatey, amazing chocolate chip scones. 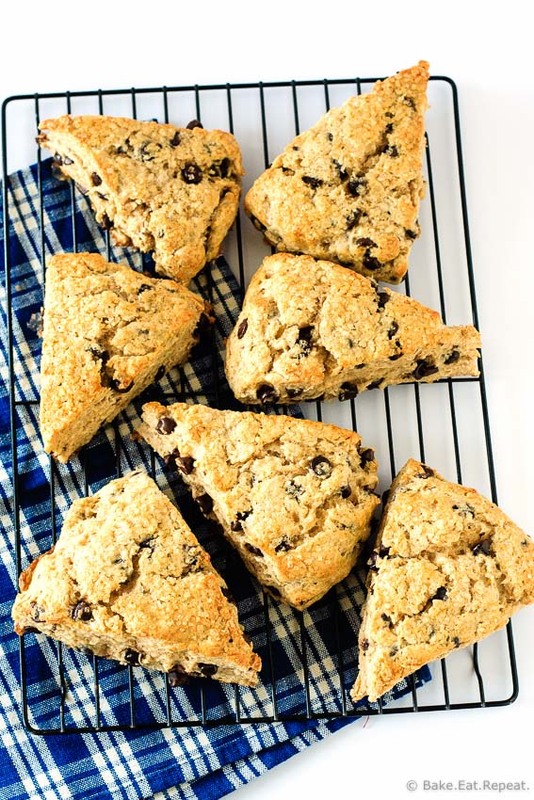 Flaky, tender, filled with chocolate chips and topped with coarse sugar - these chocolate chip scones make the perfect treat with your morning coffee! Place the butter in the freezer while getting out the other ingredients so it is very cold and easy to grate. In a large bowl, combine the all purpose flour, whole wheat flour, cinnamon, salt, baking powder and chocolate chips. Grate the cold butter into the flour mixture and mix it together with your hands or a pastry cutter. In a small bowl, whisk together the eggs, maple syrup and buttermilk until combined. Pour this mixture into the dry ingredients and stir until it is just combined. Transfer the dough to a lightly floured surface and form it into a thick circle, about 7-8 inches wide. Place the circle in the freezer to chill for 15 minutes, and preheat the oven to 425 degrees F.
Take the dough from the freezer and place it on a parchment lined baking sheet. Pat it together again into a circle and cut it into 8 wedges with a sharp knife. Spread the pieces out on the baking sheet and brush the tops lightly with egg whites. Sprinkle the tops with turbinado sugar. Bake the scones for 15-17 minutes, or until they are golden brown. Remove to a wire rack to cool. Store in an airtight container at room temperature for 3-5 days, or freeze for up to 3 months. Source: Adapted from Pinch of Yum . There is nothing worse than a dry scone...and coffee is the ONLY thing that will stand up to it. These looks delicious. Ha...I'm so guilty of buying the overpriced lattes with the scones! I will definitely have to try this recipe! They look so moist and delicious. Glad I'm not the only one! I honestly don't know why I do it! :) Thanks Holly! Coffee shop and bakery treats NEVER taste as good as they look - that's so true!! You know how I love a good scone - will definitely be saving this recipe! This looks and sound so good! LOVE the addition of the maple syrup! I have a love/hate relationship with scones. I LOVE to eat them and my thighs HATE them ;). These look phenomenal! Yup, that sounds like me. Can't let myself make them too often. I need to find a healthy scone that tastes just as good...not too sure that'll be a possibility! :) Thanks Heather! My first thought was are these scones going to be dry, stick-in-my-throat ones? LOL Just kidding. You make me laugh! Seriously, you had me at chocolate chips. And now that I know I won't choke on these scones, I'm going to make them happen!! I love scones, but definitely not when they're dry. These look so perfect and you can't go wrong with chocolate chips in there! Scones are always game on for me and these sound duhlish!! Agh getting a dry scone is the WORST! These look absolutely perfect! Wishing I had one right now. Isn't it? I hate when it's not as good as I'm expecting! :) Thanks Mariah! I am a huge fan of scones that are not dry! These look fantastic. And with chocolate chips, delicious! In my mind, chocolate is never a bad idea! Thanks Jen! These scones look perfect, Stacey! I agree, I'm definitely not a fan of the dry ones either. These look perfectly soft and filled with flavor. What a great breakfast or dessert!